Dear Unk etc [sic] etc [sic] etc. After wading through the above address, you will notice I have once more fallen into the excrement. Once again I am back among the Indians only this time they are not the white mans friends. I thought I should have enjoyed getting back among the heather but have discovered - too late - that I am an out and out Sassenach. mile at the end of it with full pack - a full kit and all our flying gear. Another twenty yards and they would have had to send the St.Bernards [sic] out looking for me. If ever a man felt cheesed with life it was me on Saturday night. Or at least, I thought I was cheesed. It wasn't until I had really got cracking on the course that I knew what being cheesed really was. We have absolutely no time to ourselves and as there is night instruction every night writing letters is almost out of the question. We work seven days a week here and they are trying to push us through in as short a time as possible before the weather breaks up for good. letters will not be in my usual flowing style. The work is cramping my normally facile literary style and what with P.T. for two hours at a stretch just to toughen us up I am just about on my knees. Tell the boys I am still holding the fort but if they don't hurry up and send a few reinforcements I think I'll sell out to the highest bidder. What with one thing and another Uncle Joe and I are having a pretty rough time. 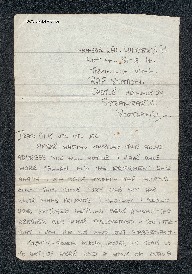 Peter Lamprey, “Letter from Peter Lamprey to W Gunton,” IBCC Digital Archive, accessed April 20, 2019, https://ibccdigitalarchive.lincoln.ac.uk/omeka/collections/document/6620.